Yes, you guessed it, it’s January 2019 and that means NEW Blasters on the horizon. Firstly, we have the new Nerf Rival Hypnos. The Hypnos introduces a magazine fed, pump-action blaster with a folding stock, and it does its job very well indeed. It’s kind of feels like the first sniper RIVAL without being an actual sniper but with some cute gimmicks and a super loading system but no slam fire, slow as you go but a worthy secondary blaster and easy to prime than most RIVAL spring blasters. It will fit into our 100+ RIVAL armoury nicely and will be very popular in game play. The first Nerf Rival Sniper Rifle has been leaked along with the release news statement of ‘Arrival of the Roman Gods’, they are the new 2019 Mercury XIX-500 and Jupiter XIX-1000 are the newest Rival blasters. They opt for bolt-action priming, clear windows to the internal magazine, and the inclusion of plastic targets. Looks like the new sniper has a bi-pod and sights and Roman mythology rather than Greek so a whole load of new names! Nerf Modulus Ultimate Customiser Pack, now this has gone ‘under the Radar’ completely and it has to be the best value pack in the WORLD and this is why: (Buy in John Lewis)This Pack is the ultimate Nerf Modulus blaster building and customisation box on the planet, motorised blaster comes with 7 tactical accessories, adjustable 3 way stock for a comfort on the chin, tactical light to illuminate targets, flip-up sight, 3-in-1 tactical rail with flip up sides to create 3 rails, 2 x 10-dart banana clip which mounts onto tactical rails, missile storage rack which links to rail holder, barrel extension, comes with 40 darts, and 4 missiles, what are you waiting for, the ultimate NERF Modulus with rocket launcher………has to be a BUY – £49.99, why is this an absolute steal, here’s why. 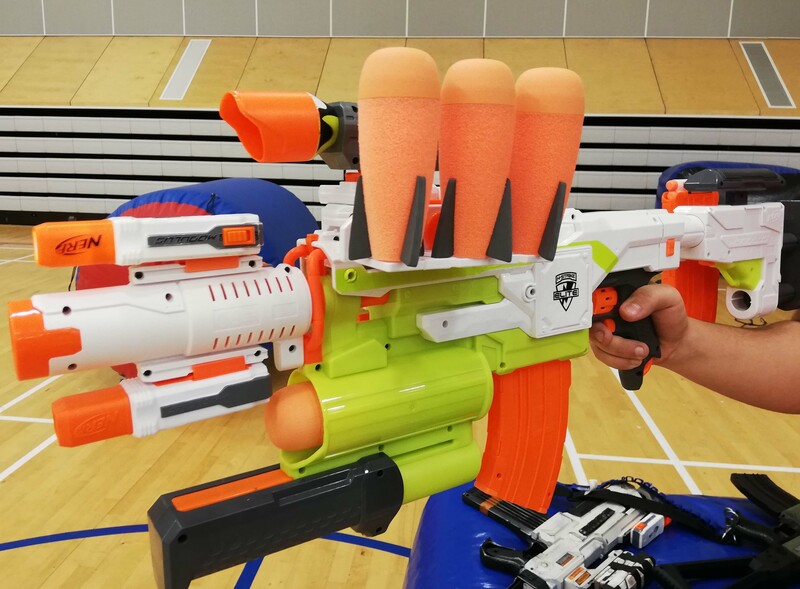 Nerf Mega Bulldog is Nerf’s second Mega Accustrike blaster to hit the UK market. The Bulldog is a super blaster which still features gimmicks, performs decently well, especially with the Mega Accustrike darts. Shadow ICS 6, another Blaster from the Ghost Ops Range with internal built in mag and top loading and visually see through so you can always see what darts are left to shoot. Full light up capabilities and Elite NERF firepower range so it is going to be very popular. NERF Elite Modulus Longstrike Sniper Rifle, now this looking exciting news for all sniper fans, seems to come with a bi-pod and paint line similar to Modulus colours. Has nice length barrel and short edged six dart magazine but looking stunning. 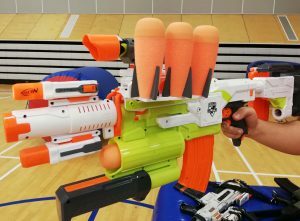 2019 NERF Blasters are looking very exciting for all NERF fans.